Looks like it's going to be a busy weekend at one of my favorite poker rooms this weekend. 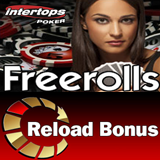 Intertops Poker has not only added extra freerolls to the schedule, they've also picked this weekend to offer a $200 Reload Bonus. Sweet. This weekend, deposit one dollar and get two. Players bitten by the tournament bug should enter Intertops’ Madrid Live Final on Sunday where they can win a $2000 prize package and play in the Madrid Live Deep Stack Poker Festival, a €770 buy-in event at the Casino Gran Madrid April 24 – 27. Intertops is one of the most trusted online poker room, casino and sportsbook sites in the world and is known for its friendly customer service and hassle-free deposits and withdrawals.